We’re just recovering from Dirt Quake IV, but wanted to put this out. This is one of the stars of a show that was packed with them. Guy Martin is admiring the special trophy that one of our fellow DTRA racers, Neil Martin (no relation) kindly made. Guy won both the W and W Harley class and the Chopper class on the Sportster chop built by Krazy Horse, Bury St Edmunds. Some details of our Dirt Quake events (racing, medical cover, marshalling) are meticulously planned. Other parts (prize-giving) aren’t and we neglected to tell Guy where and when it was happening. Because he was loading his van, he missed it, but came out later to talk to the spectators. It was our mix-up, not Guy trying to avoid a crowd. Guy Martin’s Proper brand also arranged for their friends from the Ken Fox Wall of Death to appear and put on free shows to packed houses on Friday night and throughout Saturday. Please support those who support our special event. Another big thanks to Sharon and the crew who ran the Trackside Trailer Trash camping. Without them, there would have been no camping. * People are asking about the music. Friday night were The Vitamins (from Bury St Edmunds), Saturday night was Davros and the Deep Space Deviants (from Planet Skaro). If you want to book either bands for your event, we can put you in touch. What can be better than a group of friends, a bunch of bikes and a whole load of fun? Sorry I missed it this year. Here's to 2016! 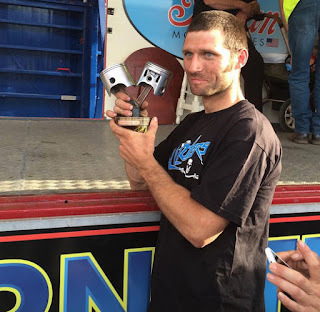 I was standing at the stage waiting to see Ken Fox's Wall Of Death and GUY MARTIN came and stood next to me!!!! Lovely bloke but you can tell he just doesn't want the limelight. Great day well worth the 8 hours round trip,roll on Dirtquake 5! !